The following few lines of text don’t even come close to capturing the depth and breadth of the island’s history. The only way to truly experience it, is to go there and walk in the footsteps of those who were there before you. The original inhabitants of Maria Island were the Puthikwilayti people – aboriginal people, and members of the Oyster Bay tribe. For more than 40,000 years the Puthikwilayti people were custodians of the land and surrounding waters. Did you get that? More. Than. Fourty. Thousand. Years. European explorers first caught sight of the island in 1642, but didn’t come ashore until 1789. John Henry Cox and Lieutenant George Mortimer (English explorers) were the first Europeans to step foot on the island and document the presence of Aborigines. In 1825, fifty convicts were brought to the island by English soldiers. The settlement of Darlington held convicts who had reoffended and they were sentenced to hard labour. 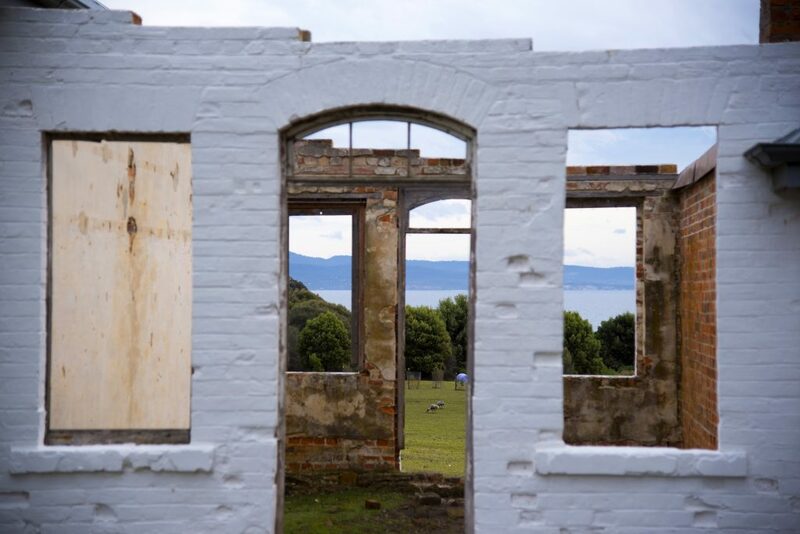 Due mainly to frequent escape attempts, the settlement closed in 1832, only to re-open again some 10 years later. The second convict era lasted for eight years (1842 – 1850) with a focus on agriculture, industry and training. Once again convict rebellion was a factor that led to its closure. The Darlington Probation Station is today, the most intact example of a convict probation station in Australia, and one of eleven convict sites recognised by UNESCO as a World Heritage Site. In the 1880s Diego Bernacchi, an Italian businessman, leased the land with ambitious plans for agriculture, industry, and tourism (wine and concrete!). At it’s peak the island had a population of 500, many buildings were re-purposed and others were built. The concrete silos adjacent to the jetty remain as a prominent visual reminder of his entrepreneurial spirit. Farming and fishing ventures followed the Italian’s failed business pursuits, and eventually the island was declared a National Park in 1972. Now it’s your turn to be part of history. Discover for yourself why this island is so special.